Instagram Nametags and Snapchat Snapcodes are both powerful tools you can be using to grow your followers. These tools make it easy for new audiences to find and engage with your social content. The best part is Nametags and Snapcodes are unique to your business profile, and can be used in a variety of ways, such as turning them into custom stickers that can be slapped, shared, and scanned with these popular apps. 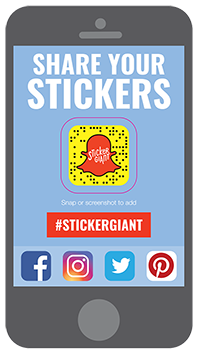 Let’s take a look at how you can get your Nametag or Snapcode into your custom sticker designs to boost your efforts when growing your followers on these networks. Snapcodes are a feature Snapchat has been built on, and if you are on this network, you already have your own Snapcode. With Snapchat you can build your own Bitmoji (this is a separate app you can download for free) to bring your personality into your code. When your Snapcode is ready to share, you can share it, and use it in different ways, and include it in your sticker designs. Step 1: Find your custom Snapcode on your profile page, and tap it to bring up the different things you can do with your code, including editing your Bitmoji, for some personalization. Adding a solid color border or background around your snapcode can also make it easier for your Snapcode to be scanned with the Snapchat app. Step 2: When your design is perfect for you, click on your Snapcode to open your share options and send your Snapcode to your email as a separate image you can use with other designs. Step 3: Add your custom Snapcode into your custom sticker designs, as an element of your artwork, or even as a separate sticker on a Sticker Sheet. 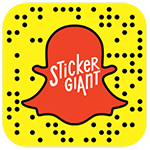 Your custom stickers can be scanned by anyone with the Snapchat app, making it easy to find and follow you on this network. Instagram gives you Nametags that you can personalize with your choice of background including fun designs, and colors. 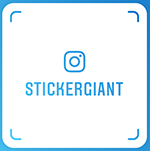 Once you have your Nametag created, anyone with the Instagram app can scan, find, and join your audience. Here’s how you can turn your Nametag into a custom printed sticker. Step 1: Open your Instagram app and navigate to your profile. Then click on the menu icon in the upper right hand corner to reveal your Nametag. Step 2: Open your Nametag and explore your options with personalization. Tap on the design option at the top of your screen to toggle through the different ways you can customize the look of your Nametag from emojis to your favorite color, or a selfie. When you find yourself on a style you like, click the open space around your Nametag to personalize it even more. Step 3: When your design is perfect for you, click the share icon in the upper right hand corner, to send your newly designed icon to your email, so you can bring this into your custom sticker designs. Step 4: Now that you have your Nametag, you, or your graphic designer can add it into your custom sticker designs. Pro Tip: For the best printing quality, be sure to change the resolution, or dots per inch, of your image from 72, to 300 before adding your Nametag or Snapcode to your design. Photo editing software such as Photoshop or Adobe Illustrator can make this an easy task too. For more tips on this, check out our page on Raster vs. Vector Images. Add Your Stickers to Customer Orders. Do you send your products to your customers? Stickers with your logo are always a fun addition for a customer when opening their new delivery. If new fans see your Instagram Nametag or Snapcode and have these apps, they can add you as a friend and start following your brand. Use Your Nametags and Snapcodes in Your Packaging Designs. You can also add your Snapcode or Nametag into your custom product label designs as part of your branding. This means more ways for your brand to get found by your customers so they can learn about your business, and the other products you have to offer. Hand Out Your Stickers at Events to Engage with Your New Fans. When you meet people at an event, you want them to remember your brand, and a custom sticker can make a big first impression that really lasts. This also gets your Nametag or Snapcode into the hands of potential new audiences, making it even easier to scan your codes and start following your content. Stick Them Around Your World. People look at stickers, and we see them everyday, just about everywhere we go. So adding your designs to the mix, in sticker friendly places of course, means anyone who walks by can find your Nametag or Snapcode. It just takes a quick scan with their app, and you have a new follower. Check out your Nametag or Snapcode on your favorite custom sticker or label product, and see how fun it is when someone scans your code and starts following your content.